Fall Into First: Meet the Measurements! Introducing - Mr. and Mrs. Measurement! It is finally finished! I am so excited to share this new product with you! I just finished my nonstandard measurement unit for K-1! 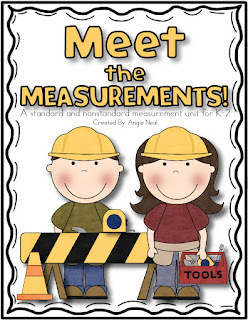 If is a huge packet with tons of activities for your students to work with measurement. I have created Standard/Nonstandard Posters with Mr. and Mrs. Measurement, a tool lesson and printable for students to sort standard/nonstandard tools, Measurement Vocabulary Posters for height, weight, and length and a vocabulary printable page for students to use, several activities that would be PERFECT for math stations, measure the room activities, comparing weight printables, a Mr. and Mrs. Measurement Craftivity and much, much more! I have spent so much time on this unit that I am now seeing Mr. and Mrs. Measurement IN MY SLEEP! AHHH! If you are currently using my Kindergarten CORE Math Units all of these activities will be part of Units 12-16. If you are a kinder teacher who is not using my CORE units, WHY ARE YOU NOT!? "Absolutely love this, my school has no curriculum and I have an hour and 15 minutes a week for a break. This is a life saver. I just found it so I will be starting it in the middle of the year. No more staying up until 3am. And no more 10hrs of weekend time at school. 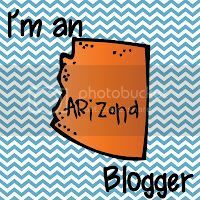 Thanks:)"
I totally understand the frustration and stress that comes along with being expected to implement new CORE standards with little to no curriculum support! That is why I have been creating math units for K-1 and the feedback has been AMAZING! 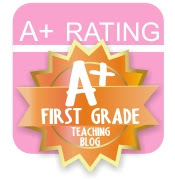 If you are still unsure, click here to take a look at the comments teachers have been making!